He settled with a bulky marker in favor of Totana Promises his visit to Albacete on Saturday morning. They played for the premises Julio Ponce, Benjamín Caballero and Antonio Castillo, while the totaneros did the brothers Julián, Santiago and Domingo Méndez. Started the match with the most even and colorful match of the day: Julián enraged the game getting 2-0 up, but Albacete Julio Ponce managed to force the fifth game, in which Julian again managed to prevail. Then, three good games of the totaneros were resolved in our favor with 3-0 markers. Domingo beat Benjamín Caballero, Santiago Antonio Castillo and then to certify the victory, Domingo solved a good game against Julio Ponce. With the victory in the pocket, Julian won in an irregular match Antonio Castillo 3-1 and Santiago by identical score to Benjamín Caballero, to place the final score at 0-6.
meeting to be held on Saturday 10 at 5 pm in the Manolo Ibáñez Pavilion. The other team of the club in Second National managed to take by the minimum one important encounter that places it in the middle part of the classification with 3 wins and 2 defeats, moving away from the posts below. For the locals Juan Francisco López, Manuel González and Juan Antonio López lined up. The totaneros lined Gabriel Sánchez, Vicente Carreño and Domingo Méndez. The meeting began Gabriel imposing 3-0 against Manuel González and signing a good performance. Then, in a match resolved by the minimum by 11-9 in the fifth game, Juan Francisco López managed to equalize the score against Vicente Carreño. 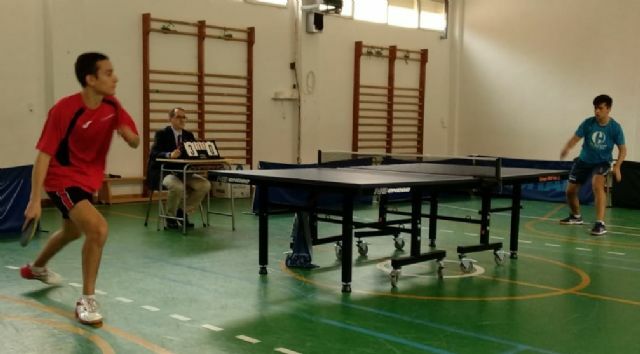 In the third game, Domingo Méndez beat Juan Antonio López 3-0, and advanced again to Totana TM on the scoreboard by putting the 1-2. However, the Mazarron managed to overcome and get ahead with the victories of Juan Francisco Lopez against Gabriel, 3-1, and Manuel Gonzalez against Domingo Méndez, who rallied a 2-0 to win in the fifth game. Vicente Carreño forced the doubles to tie the match 3 with his victory against Juan Antonio Lopez 3-0. In the doubles, Domingo and Vicente managed to seal the victory by defeating in a good game the couple formed by Juan Francisco López and Manuel González. On the next day, the Totana TM will face one of the hard bones of this group 8 of the Second National Division, the CTM Ilicitano. It will not be until Sunday, November 11 at 11 in the morning, at the Manolo Ibáñez Pavilion. THIRD NATIONAL: ATM LA NAVE 4 - 2 TOTANA "B"
Our Third Division team stood up against a tough opponent, although they gave in a tight 4-2 draw. Alejandro Lopez, Pedro José Sánchez and Pepe Carreño did the totaneros. The match began with Francisco Marín winning against Pedro José 3-0, after which Alejandro drew the match in extremis, winning the advantage of the fifth game against Francisco Cano. Juan Luis Garcia again put ahead of La Nave winning in another match Pepe Carreño, also in the fifth game. Again Alejandro, this time against Francisco Marín, put the tables back on the scoreboard when he came back from the initial 2-0 and won 3-2. In the fifth game, Juan Luís García was safer against Pedro José and, to seal the victory, Francisco Cano beat Pepe Carreño 3-1, with adjusted sets, thus putting the final 4-2. The next match of Totana B will be played next Saturday, November 10 at 5:00 pm in the "Manolo Ibáñez" Pavilion. The rival this time will be the Veterans CD Murcia, who after these first 5 days is tied in the standings with the totaneros, so a match is expected.